Happy dogs on the beach! Includes a cat on a surfboard, who also seems happy. Ubiquitous soundtrack. much wag. so splashing. The cat is not only surrounded by dogs, but is in the water. I'm not quite sure how happy the surfing cat actually is. Notice, if you will, the feline's lack of sunglasses. This is an aggressive oversight that purposely serves to throw a wrench into the otherwise carefully calibrated works. This was no accident. So where does one apply for the job that apparently involves taking dogs to the beach and playing with them all day? My friend was actually looking at dog related jobs here in Portland, OR and we have a similiar version, but instead it's taking peoples dogs on hikes. ...it's taking peoples dogs on hikes. OK, you know when you suddenly understand what you should be doing with your life? And in the place you are dying to go? That cat. I must have that cat! You mean, like how someone should be getting paid to take me on a hike in Portland? Whole lotta dogs in that van, would have loved to see them all run out like some sort of never-ending canine clown car. Really curious how that cat ended up being cool with so many dogs, the beach, and swimming. Chicago will you please get warm enough to go to Montrose Beach already? Rahm, what sort of sacrifice can I make to you for this to happen? Was that cat raised by an adoptive dog family or something? Count me among the people that want to know more about the cat. Look at all those happy dogs! My contentedness just went up in direct correlation with my endlessly repeating "look at that nice doggie. Look at that nice doggie!" He also says in the comments that he trained her to like to swim. Initially she just didn't react negatively to water, but didn't like it either, but he used gradual positive reinforcement to get her to actually enjoy it. The hell with helping troubled teenagers. I'm quitting my job today. OK, that was delightful, but no way do I want to ride home in the van with all that wet pooch. Yes, um, excuse me but we would very much like to join this group. Well! That set me up nicely for the rest of the day, that did! One of those dogs is a cat. My weinermutt was less thrilled to go surfing than these pups. Oh so great. I am keeping this as a bookmark and escaping to the beach with the fun fur crowd whenever stress strikes. This is also the best use of the "Happy" tune yet. I have owned very dog like cats before but never one that swam and rode on a board. This one is clearly the Coolest Kitty ever. I am now happy! Just as the song promised. Who could fail to be, with so many happy animal friends? Aww. 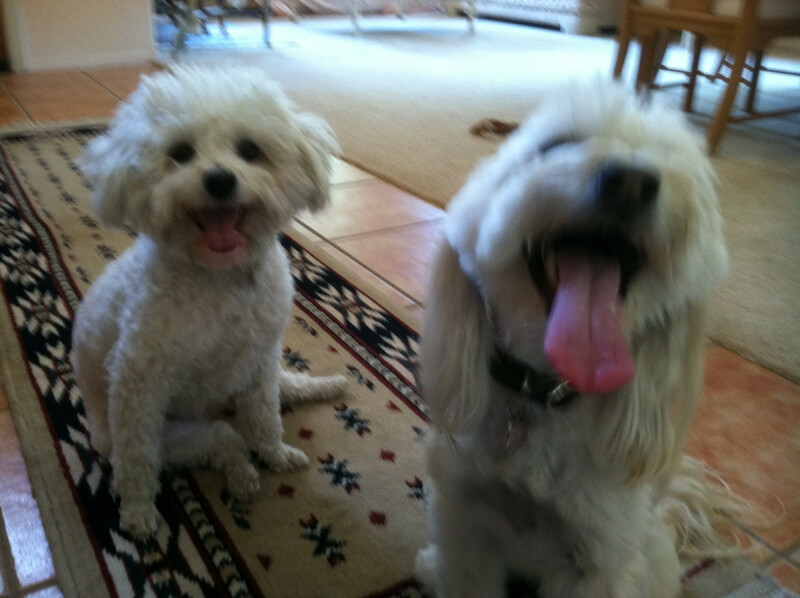 Happy doggies are happy! And that's a very unusual cat. Clearly cooler than most cats I know. I raised a kitten with two dogs. Cat thought he was a dog. Ate dog food, played fetch, curled up right beside them. Probably would have jumped right in the water with them if I had thought to do that. Smells like wet dog in here. That cat clearly has Stockholm syndrome.